Patrol-IT task management module system allows the company and its managers to define tasks, assign tasks to their field workers and track each task's status at any given moment. Different tasks type can be defined. Each type can contain different statuses, level of urgency, duration of the task and different form to fill up when reporting against the task. Task can be assign to individual employee or several employees and can be linked to company’s sites or to random address. With the opening of a new task, the task will be sent to employees that were selected to carry out the task, and from now on the task's lifecycle starts until completion or closure. 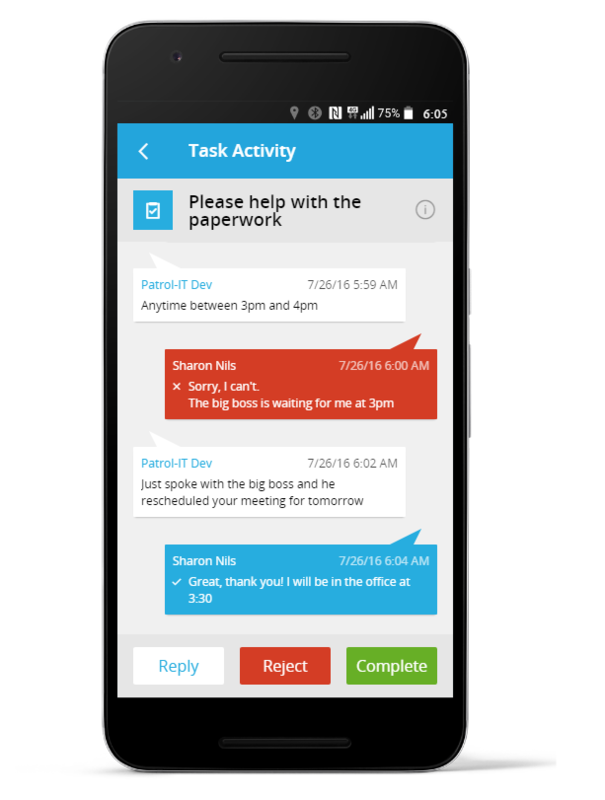 Each task is accompanied by sending push notifications to the employees. The system keeps employee level based tracking of tasks, and sends alerts to recipients list in any case of exceeding the schedule determined for the task. The task's progress for each employee can be seen and tracked, including date and time for each step, and any correspondence related to the task. Task can be sent to many employees in the organization and be assigned only to first employees that answer and approve the receipt. For example, task can be sent to 10 employees, but the first 3 employees that confirm will get the task assigned to.